Web.com Reviews - Legit or Scam? Web.com Reviews – Legit or Scam? Web.com is a new website founded to help small businesses success online by giving them access to well designed, maintained, and marketed websites that will get them noticed in the online community. 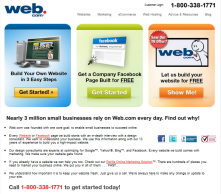 Web.com offers a “do it yourself” website building tool, a Facebook page building option, and the option to have them custom build your website from the ground up, which is currently free for a limited time. If your company already has an existing website, Web.com can either redesign your website for you, give you tips on redesigning it or updating it yourself, or simply help you market your website through their Gorilla Online Marketing Solution program. Because building a website for your company is a very specific process, you must call Web.com at 800-338-1771 to receive a personalized consultation. Every website or Facebook page built by Web.com begins with an in depth interview with a design consultant. It is the job of the design consultant to fully understand your business and what you hope to achieve with your website. Then, using their 13 years of experience, Web.com designers will use this information to build you a high impact website. All websites created by Web.com are designed with search engine optimization in mind, and all sites will be provided with 30 days of free marketing services. If you choose the option to have Web.com build your custom site for free, then you have 30 days to decide whether or not you are happy with both the website and the marketing that Web.com is providing for your site. If you are happy, then Web.com will begin charging you a monthly fee for your hosting, maintenance, and marketing services, depending on what your site requires. If you are unhappy, you may cancel your service at no charge, but you will lose your website and the marketing that had been provided. It seems as though the focus at Web.com is actually on website marketing, more than website design, as they provide their marketing services for free on a short term basis in order to encourage customers to use the Gorilla Online Marketing Solution long term. The Gorilla Marketing program promises a presence all over the internet, including Google Places, mobile and GPS devices, and social media websites. However, due to the specific needs of each individual company, no prices are published at Web.com. You must call for a consultation to determine cost of services. Average Rating for " Web.com " is 1 out of 5 based on 12 reviews. I have been with Web.com for a month now and I am NOT happy. The posts are just thrown together. Like posting verbiage about a t-shirt, but have an image of a coffee mug. I send messages to have them correct it and it goes IGNORED - so I have to call. Every single week! Even after a full interview with me they still post whatever they want so now every Monday and Thursday on my to-do list now is to call Web.com and have them correct the post, that is IF they have it in my account on Monday like they say. I expect WAY MORE for $150 a month. I'm just sick of the added steps of calling and every week they get it WRONG! Looking for a replacement!! Preferred solution: I want a personal account manager that will make sure my posts are done CORRECTLY EVERY MONDAY as you all stated you would or a FULL REFUND and cancellation of services! I didn't like: Deceptive business practices, Failure to deliver quality as promised. If I could give these shysters -100 I would do so. DO NOT USE THESE BLIGHTERS - THEY WILL STEAL FROM YOUR CREDIT CARD AND PROMISE THE EARTH - THEY HAVE RUDE IMPUDENT HARD SELLERS TRYING TO SCAM YOU TO KEEP PAYING FOR NOTHING - IT IS A SCAM. Robert Williams Junk & Co. These people are totally bogus. They take your money with $thousands of unauthorized charges. When they get ca,ght they continue to re-bill your credit card company and I have been fighting a dispute with them for over one year. There service is horrible. They don't return calls, hang up on you, have inexperienced people who sound like they are still in high school. They produced a fictitious website of products that don't exist, just to bill me for fraudulent products. This cause much negative internet reviews. We are turning this over to an attorney and the Attorney General of the State. I agree 1000% If I could give you 10000 likes for your review I would - These are a hard sell scam company - do not TRUST THEM!!! Unbelievable poor service and a lot of BS that i fell for!!! thanks,i almost sign up,then who is a good website builder? Thanks to all for the warning ! I was very close to creating an account. THIS IS A SCAM COMPANY. REPORT THEM TO INTERPOL, THE FBI AND BETTER BUSINESS! IF YOU ARE A LAWYER PLEASE LEAVE YOUR DETAILS IN THE COMMENT BOX THIS COMPANY NEEDS A CLASS ACTION SUIT TO BE BROUGHT AGAINST THEM. Set up is free, but you will pay through the nose after and not only that, if you do not pay, you will lose your Domain and everything else.